Spain - Fernando VII (1808 - 1833). 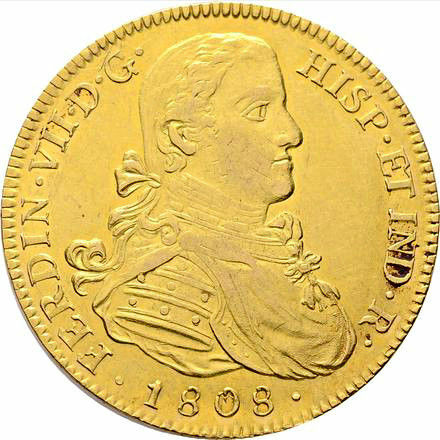 8 Escudos gold doubloon - 1808 - Mexico, imaginary bust, assayer T·H. Very scarce. In 1810, the Iberian Peninsula was occupied by the army of Napoleon Bonaparte, and his brother José ruled Spain as the illegitimate king. 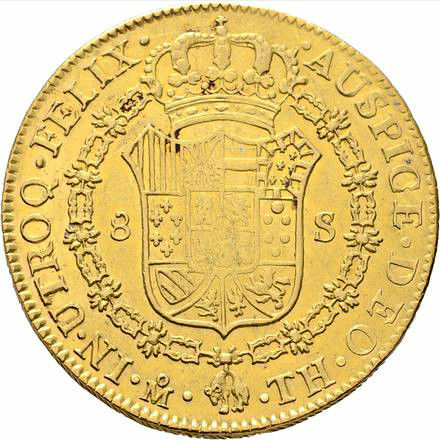 Fernando VII was still recognised as the legitimate king of Spain and all the overseas colonies; however, given the political instability of the times, it was not possible to bring punches with the royal image to the Americas, and for this reason coins were minted in the name of the monarch but with a bust of a completely imaginary person, hence the nickname for the coinage of this very turbulent period. Extremely well preserved, almost UNC. Remains of much of its original shine. Slight mintage span in the centre of the shield on the reverse, very typical of this mintage, beautiful colour! Very scarce coin! Very attractive in hand! Gold weight 27.05 g, 37 mm. 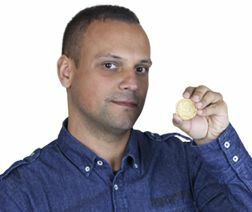 Gold purity .900. 您可从卖家地址上门自提: ALCALA LA REAL (JAEN), 西班牙.